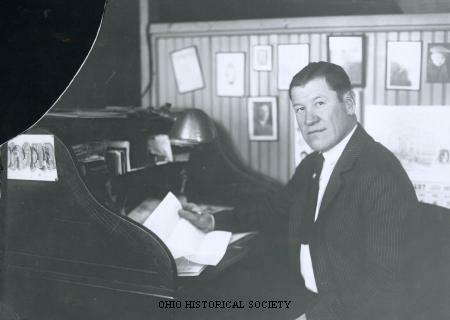 Photograph of Olympic athlete and professional football player Jim Thorpe, ca. 1920-1929. Thorpe was a American Indian of Sac and Fox descent and played football at the Carlisle Indian School in Carlisle, Pennsylvania. In 1912 he was the Olympic decathlon champion. Thorpe was one of the early superstars of the National Football League and served as the League's first president. He played for several professional football teams in Ohio: the Canton Bull Dogs, Cleveland Indians and Oorang Indians. Legendary football player and coach James Frances "Jim" Thorpe was born near Prague, Oklahoma, on May 28, 1888. His parents were Hiram and Charlotte Thorpe. Of Sac and Fox descent, Thorpe's American Indian name was Wa-tho-huck, which means "Bright Path." As a young man, Thorpe attended the Carlisle Indian Institute in Carlisle, Pennsylvania. The institute provided the equivalent of a college education; but also conducted a rigorous assimilationist program that severed young American Indians from the living traditions -- including foodways, adornment, festival and language -- of their home cultures and communities. Thorpe played on the school's football team. He soon began to make a name for himself and was named first team all-American in 1911 and 1912. He also participated in track and a number of other sports. Thorpe excelled at whatever sport he attempted. As a result of his efforts, Thorpe represented the United States in the 1912 Olympics, where he won gold medals in the decathlon and the pentathlon. After finishing school, Thorpe played professional baseball before becoming involved in professional football. He played football for the Canton Bulldogs. At this time, the modern National Football League did not exist. Under his leadership, the Bulldogs were the unofficial world champions in 1916, 1917, and 1919. When the National Football League (NFL) was formed in 1920, Thorpe became its first president. He inspired respect in all who played against him. His contributions to the game led him to become the highest paid player in the league during its early years. Thorpe retired as a player from professional football in 1928. At that time, he played for the Chicago Cardinals. He made tremendous contributions to the modernization of the game and the professionalization of football during his lifetime, both on the field and off. Thorpe died on March 28, 1953. Even before his death, Thorpe's contributions to football and his amazing athletic talent received recognition. Journalists chose Thorpe as the greatest athlete of the first half of the century in 1950. More recently, ABC's Wide World of Sports named Thorpe the Athlete of the Century in 2000.